EEhas announced the launch of their EE Film service which will be available to download via app stores and will offer a library of over 700 films including the most up to date releases, for rent via streaming or downloading. 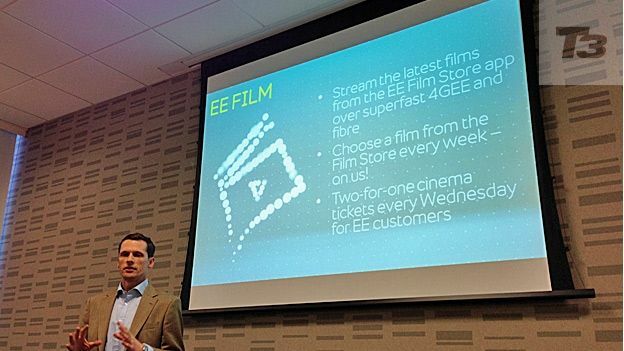 Announced at the same time EE confirmed 4G UK tariffs, customers on EE 4G will get a free film rental every week with customers able to pick any of the films in the library. All films will initially only be available in Standard Definition, this is apparently to safeguard the network while EE assess how much people will stream their films using 4G. If you're not up for using all your data in one go however you can download the film or stream it over WiFi letting you watch it anytime whether it's in the middle of the countryside or on the Underground. Pricing will start at just 79p to rent a film with new releases increasing to the substantially higher price of £3.99. EE will also offer the same 2 for 1 on cinema tickets deal that Orange customers currently get with Orange Wednesdays.